At The Center for Cosmetic Dentistry we are continuously upgrading our equipment and incorporating new technologies to keep pace with ongoing innovations in the dental field. Our AACD-accredited cosmetic dentist, Robert Rioseco, DMD, relies on several different technologies to provide efficient, effective dental care that delivers superior results. From preventative treatment to restorative and cosmetic procedures, our technology plays an integral role in diagnosing dental concerns, designing and fabricating custom dental restorations, and performing periodontal treatments. For more about the specific technologies we utilize at our practice, please review the informative sections below or contact our office to connect with a knowledgeable member of our team. The CEREC® system allows Dr. Rioseco to create 3D digital impressions, design custom restorative solutions, and fabricate the restorations right in our office. Inlays, onlays, crowns, dental implants, and veneers can often be created within the span of one appointment so that you can complete your full treatment without having to return for a second visit. Dr. Rioseco even uses this revolutionary technology to design the base for custom bridges, which are finished in the lab. The iTERO Element® 2 intra oral scanner quickly and comfortably captures comprehensive digital 3D impressions of the mouth. These 3D impressions are faster and more accurate than old tray mold techniques, which most patients find to be gooey and uncomfortable. Another benefit is that Dr. Rioseco can send your digital 3D impressions straight to the lab (no snail mail!) for quicker turnaround on your restorations and Invisalign® aligners. Using the iTERO software package, Dr. Rioseco is also able to show you digital chairside previews of your treatment progression and final outcome before you commit. VITA Easyshade® 5.0 allows Dr. Rioseco to precisely match your new restoration to the exact shade of the surrounding teeth. The results he obtains from the light-reading device can be sent along to the dental lab fabricating the restoration to ensure an accurate shade match. He will also double check all restorations with the VITA Easyshade® 5.0 to confirm that they meet the specifications he requested. The WaterLase© dental laser by BIOLASE® makes performing soft tissue procedures – such as gum recontouring, bacterial reduction, and periodontal therapy – much easier and more accurate than traditional methods of the past. WaterLase© typically results in less bleeding and swelling, which minimizes potential discomfort and significantly speeds healing. VELscope® Oral Assessment System is a handheld scope that assists Dr. Rioseco in identifying abnormalities in the soft tissue of the mouth. Using natural tissue fluorescence, he can detect tissue inconsistencies that would otherwise be invisible to the naked eye. This technology is ideal for early detection of oral cancers and precancers, which gives treatment the best chance for success. 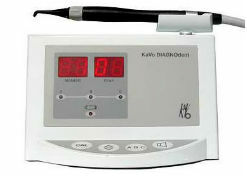 DIAGNOdent® is utilized during dental exams for early detection of cavities. This unique device uses light energy to signal the presence of decay on a tooth, which may be difficult to identify visually. DIAGNOdent® allows Dr. Rioseco to follow the progress of areas presenting decay and administer treatment as soon as it becomes appropriate. We often use intraoral cameras to show patients problem areas detected during exams and explain treatment options. Intraoral cameras help demystify dental concerns and allow for easy communication between Dr. Rioseco and his patients when discussing severity and the most effective avenues for proper care. Digital photographs and X-rays of your teeth are helpful in establishing an initial treatment plan for enhancing the esthetics of your smile. Using an accurate visual aid is always the best approach when discussing problem areas and techniques that can provide optimal solutions. Pictures taken before and after treatment can reveal the dramatic transformation that takes place after procedures are completed. Dr. Rioseco relies on Tekscan® as an effective tool for developing accurate solutions for traditionally complex bite concerns. He has been using the Tekscan® bite force analysis package at his practice for more than 15 years and has also lectured on the technology. This system has proven to be a reliable diagnostic tool, which provides Dr. Rioseco with a wealth of digital information about each patient’s unique bite characteristics. While some dental practices still use articulating or carbon paper for bite analysis, the advanced Tekscan® system creates a lifelike representation of the teeth, bite, and forces at work, which can eliminate guesswork from the bite adjustment process. During bite analysis with the Tekscan®, patients simply bite down on a thin pad containing several sensors that record data. 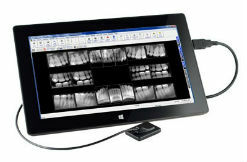 The software then generates a series of digital images which reveal when, where, and how forcefully the teeth are connecting. It also shows the degree of pressure produced between each upper and lower tooth upon impact. By properly timing the bite force at specific points, Dr. Rioseco discovers exactly which corrective adjustments need to be made, ultimately allowing him to create a more comfortable bite, protect natural teeth, and add to the longevity of restorative dental work. Often, Tekscan® bite analysis is integrated into the finishing phase of dental implants, Invisalign®, and full mouth reconstruction, and can even provide a comprehensive assessment of factors contributing to migraine headaches and common TMJ problems. For more information about the advanced technology and techniques we offer, please contact our practice.